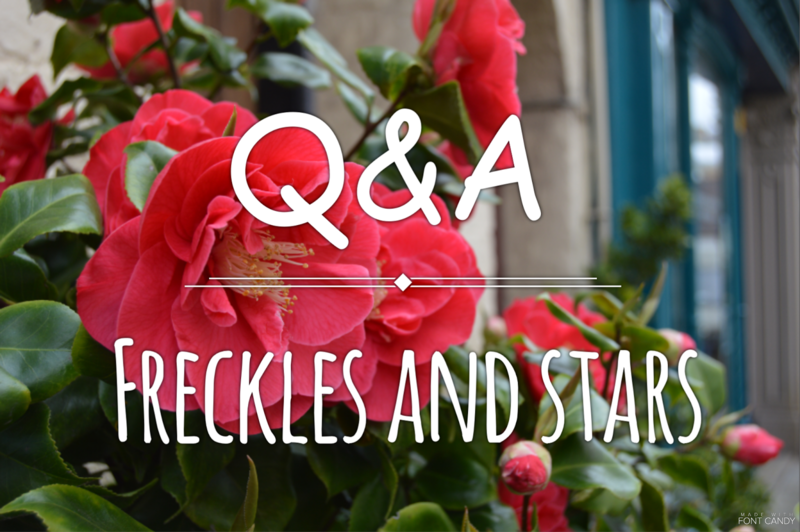 Hi readers of, Acting Natural, my name is Sophie and I come from Freckles and Stars – the link is down below! Ella has very kindly agreed to do a collab with me and she’s asked me some questions below. Soon, Ella and I will be doing a monthly boom review (hopefully) so you can look forward to that! Now, the questions!! 1) How would you describe yourself as a person? I would say I am bubbly and energetic a lot of the time but often I am reserved and someone who listens. Sometimes I have moments when I stand back and look hard at who I am and who I want to be. This usually makes me feel a bit sad because I feel like I’m a different person to what people think I am. But I hopes this changes – I’ve got awhile and I will try to evolve my personality over time so it reflects me more. 2) Do you have any role models? I think a really big role model for me is Emma Watson because of her activist work but the people around me in everyday life – such as my friends, family and teachers – play a big part too. 3)Have you ever moved to a new house or changed school? If so, do you think this has changed you as a person and how? I have moved 3 times but I only remember the most recent one. 4 years ago, I moved 170 miles. It was a big change. At that time, I was in year 4 and had some pretty good friendships but I had to move and make new ones. I remember making all these resolutions like ‘I won’t get into anymore fights’ or ‘I will be quiet and reserved – specially to begin with’. This didn’t make a difference. I soon fell back into my old self – I don’t really think moving changed me that much! 4) Is there any other memorable events that have happened to you that has changed you as a person? I think joining secondary school made a difference. I have become a lot more resilient and can take a lot more. I used to get really upset at little things but now I don’t care. I think this is because I adapted to secondary school – I let it change me! I don’t think that’s a bad thing though. 5)Have you ever experienced any issues with friends or bullying and if so, how did you resolve/ overcome the issue? I have had many issues with friends but they just get forgotten about - it’s not good to hold onto problems, so I don’t remember many. A couple of weeks back, though, my friend and I had a big argument. We were annoying each other but not intentionally. We both said and did some stuff that the other found really irritating. Eventually we had it out with each other. I think that was a good thing – it was almost therapeutic. After, we apologised and promised to be more considerate of the other and our friendship was quickly on the mend. 6) Do you have any advice or people who are about to go through change (moving house, changing schools etc)? Try not to be too nervous and remember that everyone goes through changes – big and small. Just go into it, head held high, be strong and be yourself. That way, you will adjust quickly and find your way easily. 7)Have you ever experienced sexism in school or in you day to day life? I haven’t experienced sexism personally yet – luckily – but I think it’s because I am younger. I look at what goes on around me though, like on the news and it scares me how real and close sexism is. 8) Whats you're opinion on feminism and would you consider yourself to be one? Feminism is a great idea and I would definitely consider myself to be a feminist. Unfortunately, feminism can be misunderstood but I am inspired by how it still survives and continues to fight for what it right. 9) What does feminism mean to you? For me, feminism is my safety net. I am looking forward to growing up but then I see the struggles in society to do with sexism – for both men and woman. Being a feminist and following feminist movements gives me the strength and courage to believe I can survive in the mad and messed up world to come. 10) Do you think the media accurately depicts feminists? Often yes actually. More and more I hear people coming onto the radio etc. and presenting their feminist views. This way, more people know about it. However, there’s always some presenter who will get it all wrong and go off about the ‘man haters’. 11) Do you think that the government needs to be doing more? I think so. All I hear about is Brexit and minimum wage – along with other things – but never anything about equal rights for men and women. They may be doing something but they need to publicise it more and show us that they’re doing something that’s helping to make a change. 12) What changes do you hope to see in the future? I hope that people will realise this is not a joke. Men and women need to be treated equally. It’s both genders that are being pressured to be or act a certain way and this social etiquette should not be around anymore. It needs to go. I would just like to add that the definition of feminism is ‘the advocacy of women's rights on the ground of the equality of the sexes’. So yes, it’s about women but it’s also about men. They must be equal too. They matter too. It’s about being a community and it’s about standing together.